Gadolinium-based contrast agents are widely used as a contrast agent for magnetic resonance imaging. Since gadolinium ions are toxic, many chelators are developed to bind gadolinium ions to prevent free gadolinium-associated disease. However, many reports indicated that linear chelator-based contrast agents are associated with nephrogenic systemic fibrosis (NSF) in patients with low kidney function. Therefore, the demand for stable macrocyclic chelator-based contrast agent is now increasing. 1,4,7,10-Tetraazacyclododecane-1,4,7,10-tetraacetate (DOTA) was conjugated to lactobionic acid (LBA) through DCC-NHS coupling reaction. 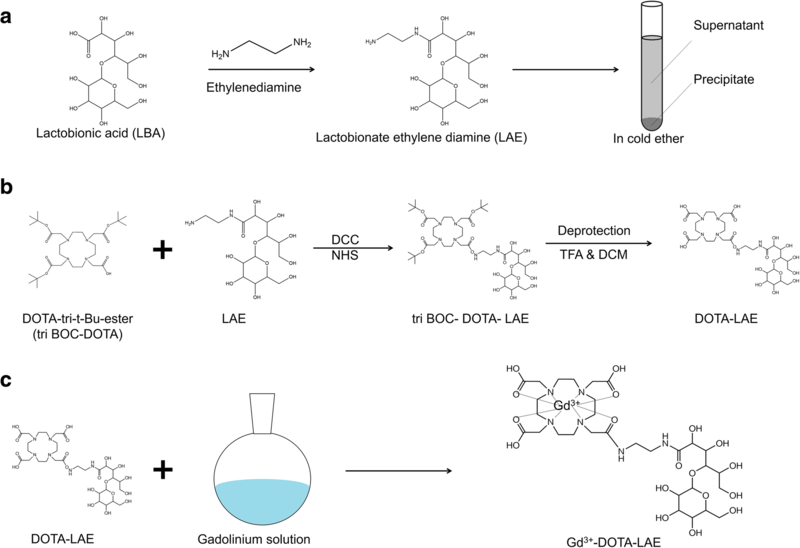 Gd3+ (gadolinium ion) was chelated to 1,4,7,10-Tetraazacyclododecane-1,4,7,10-tetraacetate-lactobionic acid (DOTA-LAE) and free Gd3+ was removed using a cation exchange column. In vitro cytotoxicity of contrast agent towards normal cells was measured using MTT assay. For in vivo MR imaging, contrast agents were intravenously injected to tumor-bearing mice and imaged by a MR imaging scanner. This new macrocyclic gadolinium-based contrast agent showed enhanced in vitro paramagnetic properties compared to Gadovist. In addition, Gd-DOTA-LAE showed a 29% increased contrast enhancement of tumor tissue compared to normal tissue within 20 min past IV injection. We developed a new macrocyclic T1-weighted MR contrast agent. This new contrast agent offers various opportunities for cancer detection and diagnosis. Early detection of cancer is essential for treatment and the survival rate of patients [1, 2]. Magnetic resonance imaging (MRI) is most frequently used imaging method for detection and diagnosis of cancer. MRI is a noninvasive method to detect soft tissue, such as organs, ligament, cartilage, and cancer regions without exposing to radiation. However, it is still hard to distinguish between tumor regions and normal region. Many contrast agents (CAs) have been developed to enhance contrast intensity and contrast effect on region of interest. Gadolinium, manganese, iron oxide, and iron platinum-based CAs are used for clinical application, because Gd3+-based T1 CAs have been proven its great safety in many clinical cases and Gd3+-based T1 CAs are the most widely applied CAs on these days. Moreover, there have been various attempts to improve the signal intensity and sensitivity of Gd3+-based CAs to region of interest [3–6]. Improvement of signal intensity is related to the concentration of CAs in region of interest and shortening the longitudinal relaxation time of surrounding water protons nearby Gd3+ ions [7–10]. One of the methods is accumulation of CAs using conjugation with bioactive moieties to increase concentration of CAs in specific regions, tumor specific antibody, and stimuli-responsive polymer [11–16]. The other method is decreasing longitudinal relaxation time of surrounding water proton using CAs [17, 18]. Increasing the signal intensity of the CAs is also important, but there are more concerns about stability of CAs. For a decade, there have been reports of nephrogenic systemic fibrosis (NSF) associated with the use of Gd3+-based CAs [19, 20], especially for patients with low kidney function . NSF is a rare and serious disease that causes severe fibrosis of skin and internal organs . It is known that release of free Gd3+ from unstable chelator may associated with NSF. For this reason, The European Medicine Agency (EMA) has recommended a restriction for linear chelator-based CAs to prevent against any dangers from release of Gd3+ . Therefore, there are demands for stable and safe macrocyclic chelator CAs. The purpose of this study was to design new macrocyclic gadolinium-based contrast agent for MR imaging of tumors. In this respect, we designed a hydroxyl group rich material conjugated CA for high water proton exchange to improve T1-weighted signal intensity. Lactobionic acid, ethylenediamine, gadolinium chloride hexahydrate, trifluoroacetic acid(TFA), N, N-dicyclohexylcarbodiimide (DCC), N-hydroxysuccinimide (NHS), Chelex ®100 (100~ 200 mesh), 3-(4,5-Dimethyl-2-thiazolyl)-2,5-diphenyl-2H-tetrazolium bromide (MTT), and xylenol orange disodium salt were purchased from Sigma Aldrich (St. Louis, MO, USA). Tri-tert-butyl 1,4,7,10-Tetraazacyclododecane-1,4,7,10-tetraacetate (tri BOC-DOTA) was purchased from Tokyo Chemical Industry Corporation (Tokyo, Japan). N, N-dimethylformamide (DMF), dimethyl sulfoxide (DMSO) and hydrochloric acid (35–37%) were purchased from Junsei Chemical Co. Ltd. (Tokyo, Japan). Ether and acetone were purchased from Samchun Pure chemical Co. Ltd. (South Korea). Dimethyl sulfoxide-d6 (DMSO-d6) and deuterium oxide(D2O) were purchased from Cambridge Isotope Laboratories (Andover, MA, USA). Gadobutrol (Gadovist) was acquired from Bayer (Leverkusen, Germany). Chang cell (human epithelial liver cells) and HCT 116 cell (human colon carcinoma) were acquired from the American Type Culture Collection (ATCC CCL 13, USA). DOTA-lactobionic acid was synthesized using carbodiimde reactions. Briefly, 1 g of lactobionic acid (LBA) was dissolved in DMF (10 mL) and activated by DCC (1.2 mol equiv. of LBA) and NHS (1.2 mol equiv. of LBA) at room temperature for 12 h. The by-product of the reaction, dicyclohexylurea, was removed by 0.45 μm syringe filter. Ethylenediamine (10 mol equiv. of LBA) was diluted with DMF (10 mL) and added dropwise to the solution of activated LBA. The solution reacted for 24 h at room temperature and purified by precipitation in cold ether and washed three times with ether. Lactobionate-ethylendiamine (LAE) was obtained under vacuum. The product of LAE was confirmed by 300 MHz 1H NMR spectrometer. (Bruker, Germany). Five hundred seventy-three milligrams of Tri-tert-butyl 1,4,7,10-Tetraazacyclododecane-1,4,7,10-tetraacetate (tri BOC-DOTA) was dissolved in DMF (5 mL) and activated by DCC (1.2 mol equiv. of tri BOC-DOTA) and NHS (1.2 mol equiv. of tri BOC-DOTA) at room temperature for 12 h. The by-product of the reaction, dicyclohexylurea, was removed by 0.45 μm syringe filter. Four hundred eighty milligrams of LAE (1.2 mol equiv. of tri BOC-DOTA) was added into the solution and reacted for 24 h at room temperature. Product (tri BOC-DOTA-LAE) was precipitated by adding cold ether and kept at deep freezer for 10 mins to complete the precipitation. The tri BOC-DOTA-LAE was washed three times with ether then dried under vacuum. 0.5 g of tri BOC-DOTA-LAE was dissolved in 3 ml of 75% TFA in DCM and treated for 40 min to remove tert-butyl group and dried under reduced pressure. The final product was dissolved in distilled water (D.W) and placed in a dialysis bag (molecular weight cutoff 500 Da) against D.W for 3 days. DOTA-LAE was obtained by lyophilizing. 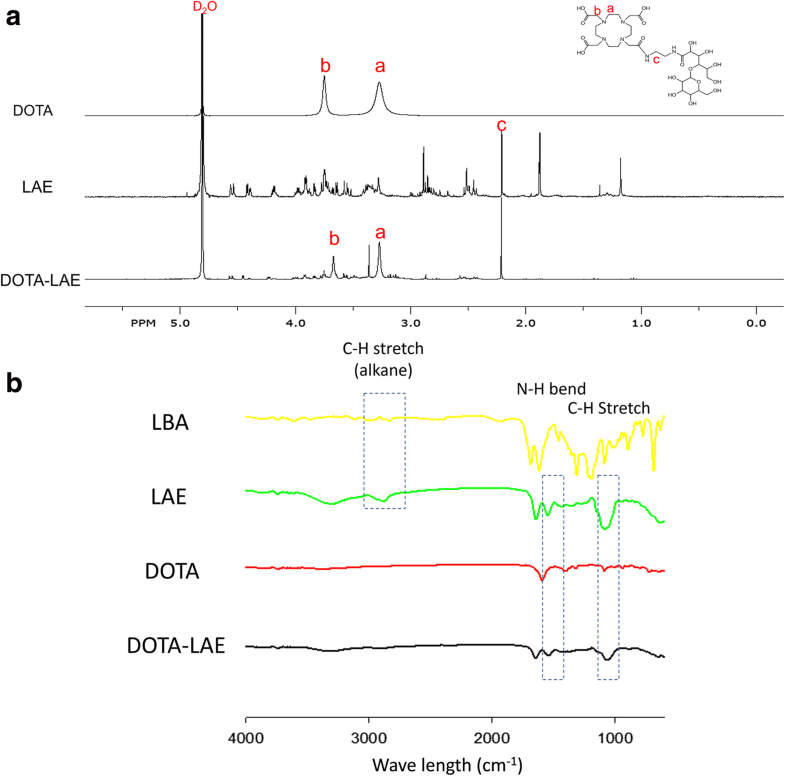 The product of DOTA-LAE was confirmed by 300 MHz 1H NMR spectrometer. (Bruker, Germany). Five hundred milligrams of DOTA-LAE was dissolved in D.W (10 ml) and gadolinium chloride hexahydrate (GdCl3∙H20) (1.2 mol equiv. of DOTA-LAE) was added to this solution, and pH was adjusted to 6 with 0.1 M KOH solution . The solution was heated to 40 °C for 24 h under stirring. Free Gd3+ ion was removed by dialysis (molecular weight cutoff 500 Da) in D.W for 3 days. One gram of chelax®100 resin was added to the solution at pH 5 and stirred gently for 1 h, then supernatant was decanted and lyophilized. The T1 and T2 relaxation times of LBA and Gadovist were measured in test tube with various Gd3+ concentrations. The longitudinal rate (R1) and transverse rate (R2) were obtained by calculating the slope of the 1/T1 and 1/T2. All studies were performed on a 4.7 T animal MRI scanner (Biospec 47/40, Bruk-er BioSpin, Ettlingen, Germany) with 72 mm coil at Korea Basic Science Institute in Ochang. Chang cells and HCT 116 cells were cultured in Dulbecco’s Medium with Earle’s BSS (DMEM, Hyclone) supplemented with 10% (v/v) fetal bovine serum (FBS), containing100 IU /mL of penicillin, and 100 μg/mL of streptomycin at 37 °C under 5% CO2. The cytotoxicities of Gd-DOTA-LAE, Gadobutrol (Gadovist), and free Gd3+ were evaluated for 24 h using the (3-(4,5-Dimethyl-2-thiazolyl)-2,5-diphenyl-2H-tetrazolium bromide) MTT assay. Chang liver cells were seeded into 96 well plates and incubated under 5% CO2 at 37 °C. Gd-DOTA-LAE, Gadovist, and free Gd3+ in 100 μl of SF medium were added to each well in a concentration- and time-dependent manners. 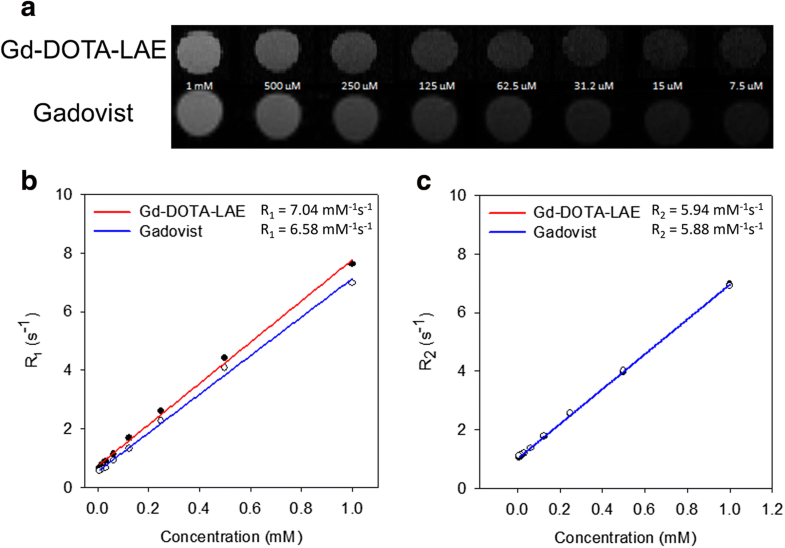 To measure cytotoxicities by time-dependent manners, 0.1 mM concentration of Gd-DOTA-LAE, Gadobutrol (Gadovist), and free Gd3+ were treated at each time point. Then 10 μl of MTT solution (0.5 mg/ml) was added to each well and incubated for additional 4 h. Media containing MTT was removed and the blue formazan crystals trapped in living cells were dissolved in DMSO (100 μl). The absorbance of formazan crystal in the wells was measured using a microplate reader at 570 nm. All procedures were approved by the Institutional Animal Care and Use Committee (IACUC) of the Catholic University of Korea in accordance with the “Principles of Laboratory Animal Care”, NIH publication no. 85-23, revised in 1985. HCT 116 cells (1.0 × 106cells) were suspended in 100 μl of phosphate buffer saline and injected subcutaneously into male BALB/c mice. When the tumor volume reached about 300 mm3, GD-DOTA-LAE (0.1 mmol/kg) and Gadovist (0.1 mmol/kg) were injected into the lateral tail vein of male BALB/c mice. Mice were placed in a 4.7 T animal MRI scanner (Biospec 47/40, Bruker BioSpin, Ettlingen, Germany) and MR images were obtained before injection and every 5 mins for 1 h following application. One gram of DOTA-LBE was dissolved in 100 ml of D.W and 5 g of chelex ®100 resin was added into the solution to remove unreacted Gadolinium. Solution was stirred gently for 1 h and supernatant was filtered and lyophilized. 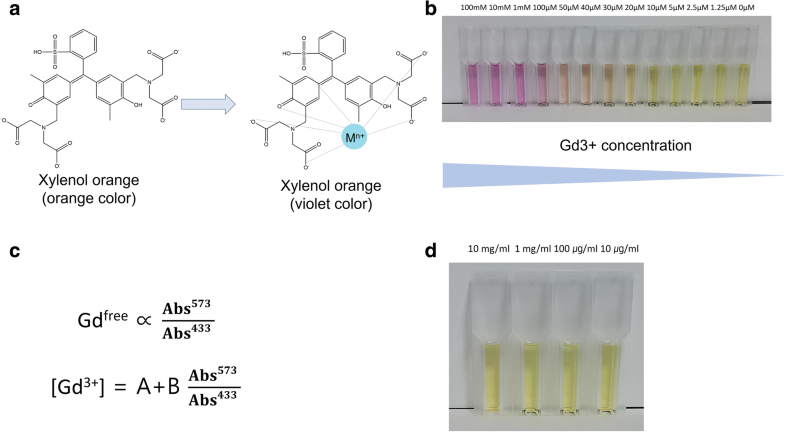 Concentration of free gadolinium ion was determined using xylenol orange method . The ratio of absorbance at 573 and 433 nm is proportional to the free Gd3+ concentration. The chelated gadolinium (Gd3+) contents were estimated using Inductively coupled plasma-optical emission spectrometry (ICP-MS) (PerkineElmer, Optima 4300 DV, Norwalk, CT, USA). Data was represented as mean ± SD for all the groups. The statistical analysis was performed by Student’s t-test and p < 0.01 was considered statistically significant. To synthesize Gd-DOTA-LAE (Fig. 1); carboxyl group of lactobionic acid was modified through the reaction with ethylenediamine to introduce primary amine on lactobionic acid (Fig. 1a) and p-DOTA was introduced to LAE. Tert-butyloxycarbonyl protecting group was remove by reaction with TFA (Fig. 1b). 1H NMR spectrum showed hydrogen peaks of DOTA at δ 3.67 ppm (2H,s, CH2-N), δ 3.27(4H,s, CH2-CH2-C) and hydrogen peak of LAE at δ 2.21(4H,m, =CH2-CH2-N) as shown in Fig. 2a. In addition, FT-IR spectroscopic analysis showed that DOTA was successfully modified to LAE (Fig. 2b). Gd3+ was chelated with DOTA-LAE (Fig. 1c). 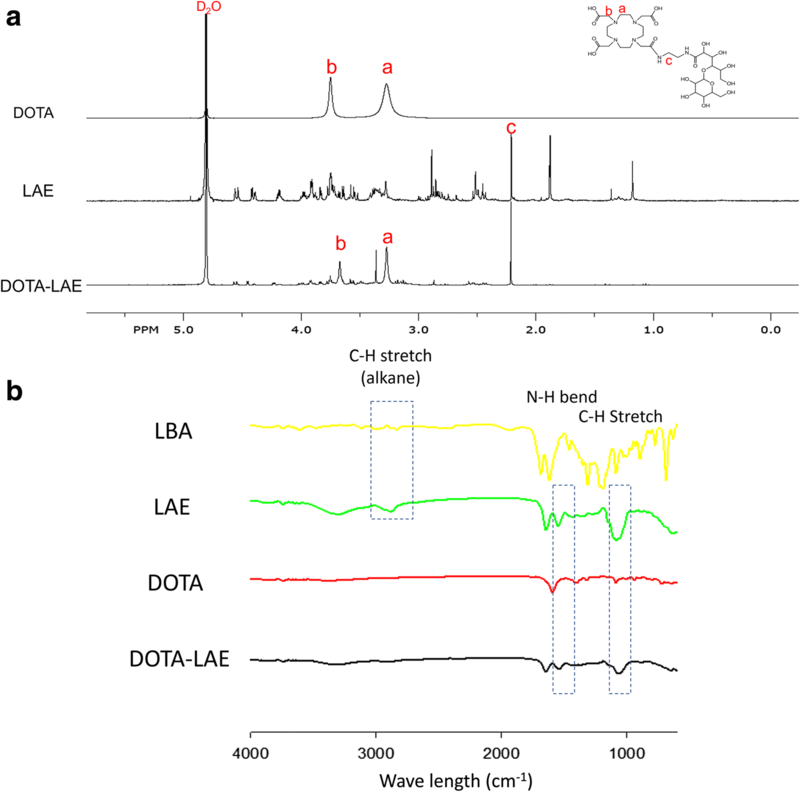 Inductively coupled plasma atomic emission spectroscopy (ICP-MS) was conducted to quantify the contents of Gd3+ in Gd-DOTA-LAE (Gd3+ contents; 16.0%). Comparison of in vitro paramagnetic properties between Gd-DOTA-LAE and Gadovist was estimated using 4.7 MR scanner. Gadovist was used for comparison study as a macrocyclic chelate-based CA. For CA, R1 and R2 relaxivities of compound are major factor to indicate the contrast efficacy of T1 and T2-weighted CAs. For T1-weighted CAs, shortening T1 relaxation time is important to increase the contrast effect. Therefore, T1-weighted CAs have high R1 ratio and low R2/R1 ratio. On the other hand, T2-weighted CAs have high R2 ratio and relatively high R2/R1 ratio compared to T1-weighted CAs. As shown in Fig. 3a, contrast intensities of phantom images were obtained at various Gd3+ ion concentration. GD-DOTA-LAE showed similar contrast intensity with Gadovist (Fig. 3a) and Gd-DOTA-LAE showed the relatively high R1 value and similar R2 value compare to Gadovist (Fig. 3b & c). In addition, R2/R1 ratio of Gd-DOTA-LAE (0.84) is relatively lower than that of Gadovist (0.89). These results indicate that Gd-DOTA-LAE may be used for potential CA for T1-weighted MR imaging. Gadolinium, as a free ion, is causing serious disease known as nephrogenic systemic fibrosis (NSF) to patients with low kidney function . Therefore, we evaluated the cytotoxicity of Gd-DOTA-LAE, free Gd3+ ion and Gadovist on chang liver cell line via MTT assay. Gd-DOTA-LAE and Gadovist showed no serious toxic effect at high dose. Whereas, free Gd3+ ion showed a serious toxic effect at high dose. In addition, Gd-DOTA-LAE and Gadovist showed no serious toxic effect in time-dependent manner. We supposed that DOTA-LAE strongly bind to Gd3+ ions and minimizing cell interaction with Gd3+. Thereby DOTA-LAE did not show the cytotoxicity at high concentration or long periods of time, whereas, free Gd3+ showed high cytotoxicity (Fig. 4). Content of free gadolinium is determined using xylenol orange method (Fig. 5a & b). The ratio of absorbance at 573 nm and 433 nm is proportional to the free Gd3+ concentration (Fig. 5c). In 1 g of Gd-DOTA-LAE, 7 μg of free gadolinium (0.007%) contents were determined using this method (Fig. 5d). Xylenol assay and ICP-MS results indicated that most of Gd3+ ions are tightly chelated with DOTA-LAE and free Gd3+ ions were successfully removed by cation exchange column. 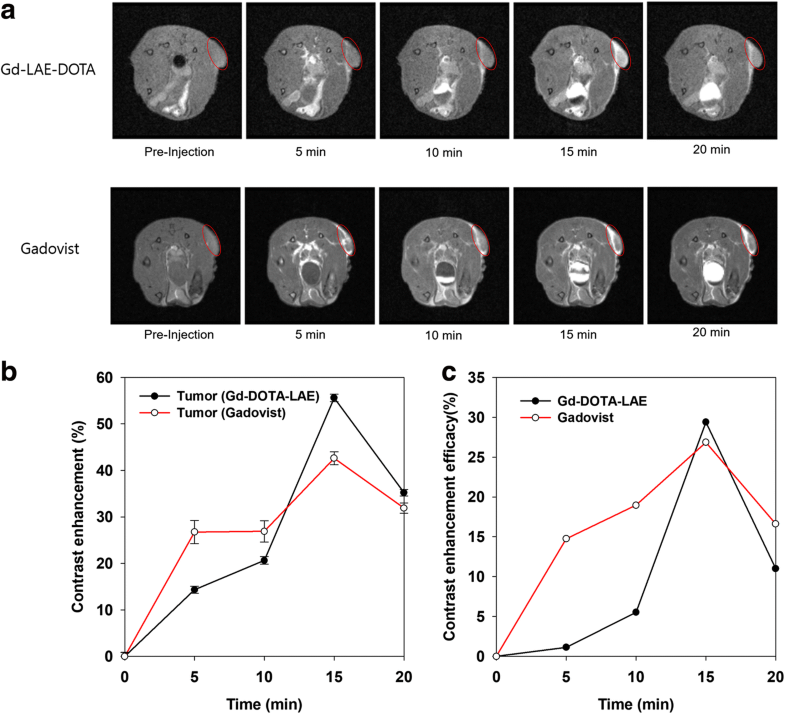 To evaluate the cancer diagnosis efficacy, 100 μl of Gd-DOTA-LAE (0.1 mmol/kg) and Gadovist (0.1 mmol/kg) were injected into the lateral tail vein of tumor bearing male BALB/c mice and MR image was obtained by 4.7 T animal MR scanner (Fig. 6a). The contrast enhancement of region of interest (ROI) was calculated with the following equation. Contrast enhancement = (ROI post-injection/ROI pre-injection) × 100. In the case of Gd-DOTA-LAE, normal region showed 20% enhanced T1 contrast within 20 min, the tumor tissue showed 53% enhanced T1 contrast effect within 15 min (Fig. 6b). In the case of Gadovist, normal region showed 20% enhanced T1 contrast within 10 min, the tumor tissue showed 42% enhanced T1 contrast effect within 15 min (Fig. 6b). The contrast enhancement of tumor tissue compared to normal tissue was calculated by following equation. Contrast enhancement efficacy = [%, (Tumor post-injection/Tumor pre-injection) × 100- (normal tissue post-injection/normal tissue pre-injection) × 100]. The efficacies of Gd-DOTA-LAE and Gadovist were reached to 29 and 26% at 15 min post injection, respectively (Fig. 6b). 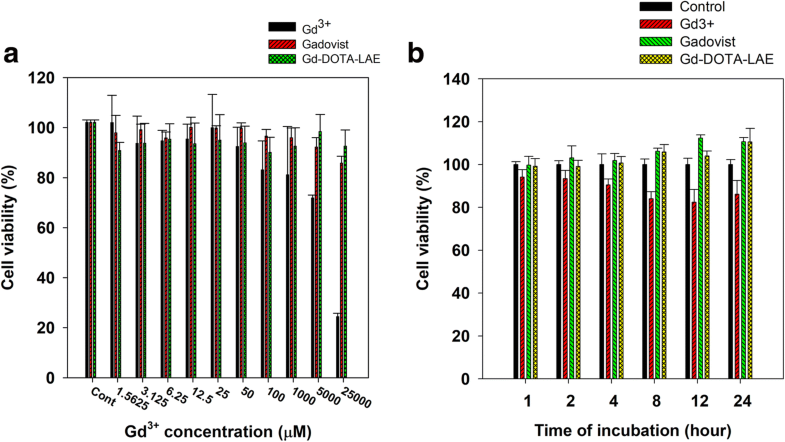 Specific accumulation of Gd-DOTA-LAE was observed in cancer region. Therefore, Gd-DOTA-LAE can be used as a CA for cancer diagnosis. For several decades, various attempts have been applied for accurate diagnosis of cancer. Magnetic resonance imaging is one of the most significant technologies for diagnosis. MR imaging technology helps surgeon make an accurate diagnosis and surgery. In this study, we designed DOTA conjugated lactobionic acid as a tumor diagnosis CA. Gd-DOTA-LAE and Gadovist showed 29 and 26% enhanced contrast intensity in tumor tissues compared to normal tissues within 20 min post injection, respectively. These enhanced contrast effects are explained by the water proton exchange rate. As is known to all, T1-weighted contrast effect is obtained by shortening the spin-lattice relaxation time of water protons around Gd3+. We used a lactobionic acid as biocompatible organic acid conjugated with DOTA. In addition, LBA has many hydroxyl groups which improve the water proton density around Gd3+ ion by hydrogen bonding, thus it provides the enhanced water proton exchange rate. Therefore, we obtained an enhanced contrast intensity with Gd-DOTA-LAE. Furthermore, there have been reports of nephrogenic systemic fibrosis (NSF) associated with the use of linear chelator-based CA in the past decade. For this reason, there are increasing demands for macrocyclic chelator-based CAs. In this respect, Gd-DOTA-LAE could be used for T1-weighted MR CA in clinical application. In conclusion, this study aims to investigate new macrocyclic chelator-based CA. This CA was synthesized DOTA with primary amine modified lactobionic acid using DCC-NHS coupling reaction. In vitro paramagnetic properties showed relatively enhanced T1 contrast effect compared to conventional macrocyclic CA. In addition, Gd-DOTA-LAE showed 29% enhanced contrast intensity at tumor sites compared to normal tissues within 20 min post injection. These results support that Gd-DOTA-LAE can be used for clinical application for MR imaging. The research was designed and performed by YJ. Data analysis was performed by YJ and KN. YJ and KN wrote the manuscript. Both authors read and approved the final manuscript. All procedures were approved by the Institutional Animal Care and Use Committee (IACUC) of the Catholic University of Korea in accordance with the “Principles of Laboratory Animal Care”, NIH publication no. 85–23, revised in 1985.